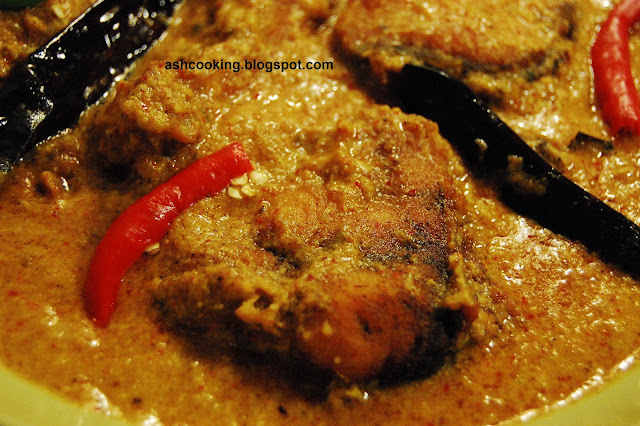 Rohu Kajuri is an awesome Bengali dish that will leave anyone licking his fingers. It came out of my mother's kitty who oft-repeated this item to meet our cravings. The gravy, cooked with cashew nuts paste and yogurt, lapping up against the soft pieces of Rohu is an absolute bliss when mixed with rice. You may try out this recipe with other fishes too. Hitherto I prepared this only with Rohu, but am certain it will turn out as delicious as with Rohu with other fishes also. 1) Heat oil in a frying pan and when oil turns smoking hot, toss in the rohu fishes and brown them on both sides. Once fried, keep them aside. 3) Heat oil and add dry red chillies and bay leaves. Once they begin to splutter, add the above paste and saute till the mixture turns golden. 4) In a separate bowl, make a mixture out of yogurt, turmeric powder and chilli powder. Whisk the yogurt to a smooth consistency before adding turmeric and chilli powder. 5) Once the onion and cashew nuts paste in the frying pan turn golden in color, add the mixture of yogurt and simmer on low heat for 5 minutes. Add salt and sugar. Then add 2/3 cup of water and when water starts to boil, throw in the fish pieces. 6) When the gravy gets the desired thickness, sprinkle garama masala and mix gently with the gravy. Serve hot.